When you have those over-ripe bananas staring you in the face, you don’t need much else to make this super delicious, healthy bread (insert mouth-watering here). No oil involved or white sugar. You don’t even use the whole egg, just the whites. Bring it! Nothing wrong with sprinkling a little brown sugar on top before baking, right? Obviously I had a little piece this morning, and also brought another piece to indulge in tonight during yoga teacher training – it’s the perfect, most delicious snack to hold me over til a super late dinner. Yeah, I’m still salivating… Not quite as good as Nana’s aforementioned banana bread, but not far off considering the healthy factor. 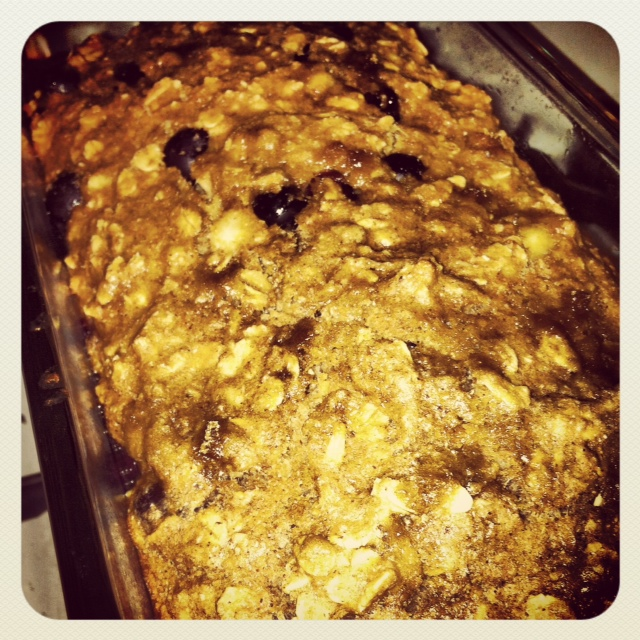 Oatmeal, bananas, blueberries – it’s magnificence all smooshed together in a bread. And that brings me to the next topic; no, we’re not quite done yet. Cravings can be the worst, and at times, can be über hard to control. Hence, why I just had to make that bread last night. Lack of primary food. We’ve been over this concept in previous posts, but what’s going on in your life? – A bad relationship? Unhappy with your job? Are you stressed? Bored? If so, eating can help fill a void. Water. My advice: when you think you’re hungry or have a craving of some kind, try drinking a glass of water before you eat. Most times the water will suffice! Comfort food or something you’ve recently eaten. Sometimes cravings are triggered by foods we ate when we were younger (I categorize this as comfort foods and I’m going to blame the banana bread baking on this factor) or something we’ve recently eaten. Try eating a healthier version when these cravings hit. Seasons. This might be where I’m the worst – for example, did you notice my obsession with all things pumpkin a few weeks ago? It’s not even technically fall yet! But if you think about it, most times in the summer, we crave cooling foods (raw foods, ice cream) and in the fall we like grounding foods (think: squash, onions, nuts). And let’s not forget winter and craving hot foods (meat, fats). Lack of nutrients. We tend to crave what we’re lacking. Like, if you have insufficient mineral levels, you might crave salt as a result. De-evolution. Doing really well on a diet and exercise plan? Sometimes we self-sabotage and start craving foods that throw our bodies out of whack. We’ll blame possible low blood-sugar for this, most of the time. Yeah, I made the bread and gave in – oops! It happens. But next time you’re hungry and think you need to eat, try drinking some water instead. See if the hunger goes away. And, next time you get a craving, stop for a minute and evaluate why you might be having this craving versus giving in. I think you’ll be surprised with the result! Here’s to a cravings-free Wednesday! 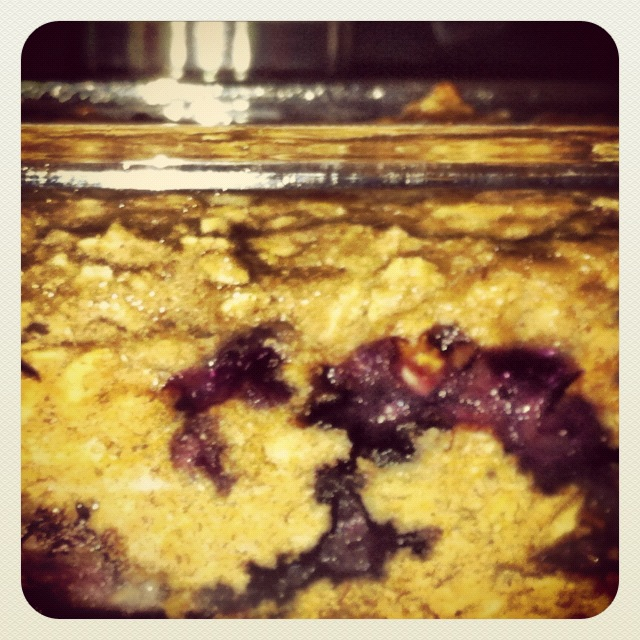 Oh wow, that oatmeal blueberry banana bread sounds amazing! Thanks for sharing! You’re welcome! If you end up making it, enjoy! Nothing beats your classic banana bread, but I will give the health version a whirl! Aw, thanks Jen – I knew the “Banana Bread” in the title would get your attention! It was delicious! Can’t wait to try to make it myself. I love when you make my recipes! Try the Dark Chocolate Raspberry Oatmeal Banana Bread. Super Healthy, almost vegan, and gluten-free! Also, I’m sure the bread was more dense because of the whole wheat flour, next time you could try oat flour? Thanks – I love making them! And thanks for the oat flour tip, I’ll def have to give that a go next time… Your Dark Chocolate Rasp Oatmeal BB has been added to the “must make” list! I love banana bread and often make it for the kids! I use half the amount of sugar or use sweetener instead and add oats on the top before baking to add a few more complex carbs! I will be giving this one a go though! Bananas are the best…definitely try making this bread next time you have over-ripe bananas – amazing! I’m going to try it tomorrow! I was planning on making my mother-in-law’s recipe (that is our go-to), but I’m going to make your version instead 🙂 I have a friend and her children coming over on Friday, so I think this will be a nice healthy snack! It’s the perfect healthy snack – enjoy! Brown sugar on top is key! Honestly, you can’t really even tell this bread is healthy – it’s that good! Courtney I tried this recipe last night…..it was delicious!! I’m so happy you tried it AND liked it!!! I think I ate almost the whole loaf by myself!